It’s finally landed, and it’s a big beast indeed. 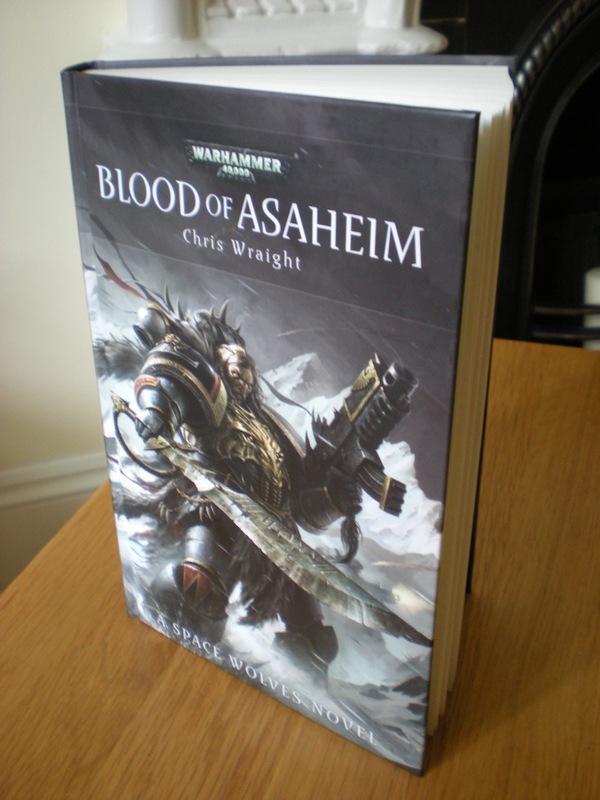 Forgive the repeat posting about Blood of Asaheim – it’s my first hardback release, and I’m still quite excited about it. There is something special about hardbacks, after all – the size, the weight, the solidity. It feels like you’ve created something that might last for a while, and that’s a nice thought to have. I’m biased of course, but I think it looks fantastic, especially Raymond Swanland‘s gorgeous cover art. Fancy picking up a copy? There’ll be plenty for sale at BL Live, which is now less than a month away. Last time I looked there were only 30 tickets left, so might be worth hurrying if you want to come along. Incidentally, there’s also a teaser right at the back of the book advertising a short story called ‘Wulfen’. Wonder what that’s about? Other than that, I’ve done a little housekeeping around here, adding links to some recent stuff that’s come out recently or will do soon. Apart from the mighty Blood of Asaheim, the 40K page now has an entry for the Advent short Failure’s Reward. I’ve also added The Sigillite to the Heresy page. Sadly, as many of you will know, Graeme’s Fantasy Book Review stopped publishing new pieces a while back. I’ll miss the site: I enjoyed Graeme’s reviews and thought he always had interesting stuff to say. I’ll leave the link up, as there’s loads of material still up. I don’t read nearly as many reviews as I used to, but I did notice that the British Fantasy Society is publishing reviews of a lot of BL books recently, so I’ve added a link to their site. Not before time, I’ve also added three new BL authors’ websites: David Annandale, who penned the recent Chains of Golgotha and Lord of Death, real-life Boba Fett Josh Reynolds, author of the new Gotrek and Felix novel Road of Skulls, and fellow south-wester Guy Haley, whose Baneblade and Skarsnik are out soon. Nice to see such new blood writing for BL (though it does remind me, rather depressingly, of when I could claim to be a newbie too). Something different today. In the interests of international peace and goodwill, this post will mostly be in French. Aujourd’hui, ce blog sera en français, en l’honneur de la nouvelle édition de «Les Épées de l’Empereur: Schwarzhelm». Mes excuses à tous les lecteurs natifs français: mes compétences linguistiques sont terribles – je aurait dû me concentrer davantage à l’école (heureusement, Google est là pour aider). «Schwarzhelm» a été initialement publié en anglais sous le titre Sword of Justice, et est le premier volume d’un dyptique racontant l’histoire de Ludwig Schwarzhelm et Kurt Helborg. Je suis très friands de ces livres, et ces personnages. J’avais déjà écrit un livre pour la série des «armées Empire» appelée «La Compagnie de Fer» (qui est également disponible en français), mais Sword of Justice a été le premier de mes livres où j’ai eu le sentiment de vraiment avoir compris l’Empire et de sa culture. Raghram se montra enfin. Son suaire de ténèbres s’évanouit comme une nappe de brume dispersée par le vent. Il se redressa de toute sa hauteur au-dessus de la silhouette robuste de Schwarzhelm. Le monstre était vieux et gigantesque, et le dépassait de plusieurs têtes. Il puait la mort et la corruption. Ses mains burinées tenaient une hache aussi grande qu’un homme. Quatre cornes imposantes ornaient son front, et sa gueule balafrée était garnie de crocs énormes. Il portait une cuirasse et des épaulières dentelées en fer. Ces protections grossièrement forgées étaient décorées des runes des dieux sombres. Ses yeux injectés de sang laissaient transparaître une ruse animale et toute la rancœur accumulée au fil des siècles par les créatures les plus malveillantes de la forêt. Toute l’aversion d’un monde primitif envers la civilisation des hommes se lisait dans ce regard. Cette créature ne ressentait rien en dehors d’une haine que seule la mort de ses ennemis pouvait apaiser. Raghram se débarrassa des derniers lambeaux de ténèbres qui l’entouraient en rugissant, puis chargea. Ses gors le suivirent sans hésiter. La nuit était presque tombée. Les chevaliers tinrent leur position imperturbablement et se préparèrent au choc; Schwarzhelm rejeta sa cape en arrière. Il leva son épée, et tout ne fut plus qu’ombres et tumulte. That’s Schwarzhelm and Helborg, looking suitably grim and purposeful. What a wonderful cover – very different from the original Warhammer Heroes line, but equally impressive. Swords of the Emperor is out in October, and will be my first Omnibus from BL. I’m excited about this – it’ll be a very big book when it’s back from the printers. Some other stuff to report: the Wrath of Iron edits are all but done, and BL have put up an extract from the book on their blog to whet your appetite. Look out for this in July. Luthor Huss continues to pick up reviews. Here’s one from the Lincolnshire Echo which was short but sweet, and a longer one from the I Will Read Books blog. Thanks to both! Finally, a quick plug for the BL Weekender event in November. This is shaping up to be a huge event, with a whole swathe of authors and artists already confirmed. I’ll be there, and will look forward to chatting about all things Iron Hands, Space Wolves, Warrior Priests, and perhaps other stuff too. Hmm. It’s been so long since I blogged that WordPress has changed its editor while I’ve been away. This is slightly disconcerting. There’s now a live preview, which shows a post as it’s being composed – typos, malapropisms and all. It’s very clever, but it does expose how haphazardly my mind works. Anyway. Despite being snowed under with edits to Wrath of Iron, it’s been nice to see Luthor Huss get some attention in various corners of the internet. Kodanshi has made a wonderful recording of one of the opening sections – you can listen to it here. This was interesting for me, since I haven’t (yet) done an audio drama for BL. I wouldn’t have the first idea of how to create one either, so I’m very impressed with Kodanshi’s effort, and it was very nice to hear my words being performed. A few reviews of the book have popped up, too. Graeme Flory over at Graeme’s Fantasy Book Reviews has given it a write-up, which you can read for yourself here. He always has interesting things to say about the BL books he covers, so it was good to see that he liked it. I was also very pleasantly surprised to see that he’d included Sword of Vengeance and Dragonmage in his favourite books of 2011. Prolific reviewer for The Founding Fields, Bane of Kings, has also penned a review, which is here. All very much appreciated. In other news, there’s an interview with the Bloghole here – thanks to Shadowhawk for setting it up. What else is new? Well, expect to see a new Space Wolf story from BL soon. It’ll be called Kraken, and will be available from the website only. I’ll be blogging about that in more detail soon. I’m currently very busy on a novella, which I’m really enjoying – more on that soon. In between all that, I’m finding time to read extracts of Nick Kyme’s marvellous upcoming tale, The Great Betrayal. Let me tell you, Dwarf (and Fantasy) fans: you’re not going to want to miss this one. I’ve been working with Nick for a while on some of the ideas for this series – I’m only halfway through the current draft, but already the book is bursting with cool revelations and epic battles. All good stuff! Sadly, I wasn’t able to make the SFX Weekender this year as I’d hoped to. However, I am hoping to be at Adepticon in the Spring and the BL Weekender in November, so it’ll be good to catch up with folks then. Finally, a quick shout-out to exceptional writer and expert editor Nicola Vincent-Abnett, who has been chronicling her remorseless rise to literary fame and fortune in her new(ish) blog over here. Proof, if it were ever needed, that success and general all-round niceness need not be strangers.